ATHLETICS Ireland has promised to "thoroughly investigate" the starting problems that marred Athlone's major indoor international mid-week and correct them in time for this weekend's GloHealth National Indoor Championships. Wednesday's meeting saw Qatari high jumper Mutaz Barshim attempt a world record and attracted massive interest from abroad but there were some embarrassing problems with the starting system. Both of the 60m finals had to be re-run because of starting 'failures' - when the gun fails to trigger the timer and photo-finish. That happened a third time when the men's final was first re-run so it needed three attempts to be completed and the visiting elite women chose not to even take part in their re-run. 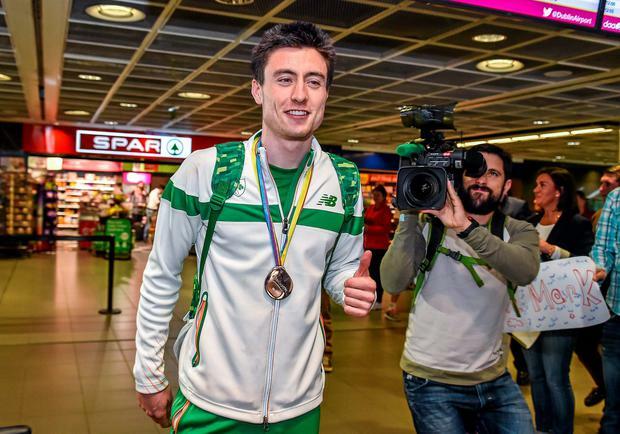 The delays forced the event to over-run by half an hour which meant it also lost the live television feed in the middle of the men's mile which resulted in Ireland's first sub-four-minute run indoors. This is not the first time Athlone's starting system has come under scrutiny. In 2013, when the stadium first hosted national indoors, there were 16 false starts in the 60m races, four in one men's heat alone. Joint Irish 100m record holders Ailis McSweeney and Amy Foster were both disqualified for false-starts in their final and McSweeney formally complained to AAI about the starting blocks. Athlone's world-class stadium seems to produce unusually high rates of false starts and athletes have alleged that either the blocks are calibrated too tightly or the sound of the gun is being affected by the building's acoustics. AAI revealed yesterday that the system was returned to its manufacturer for testing at the end of 2013 and they found no fault with it. A representative from the makers also attended last year's national indoors and again said it was functioning correctly. AAI also brought in a sound specialist to monitor an U-23 championships in the past year and he found no problems either. Peter O'Hanlon said "we are happy that all the false starts happening in Athlone are false starts" but he accepted that starting failures are unacceptable. "We will have a large technical team on site early on Saturday morning and will fire off the system at every conceivable angle to make sure everything is working," he added, stressing that the system has been exhaustively tested. With athletes chasing European Indoor qualification standards and Irish titles over the next two days, it is imperative that there are no more technical glitches. European 800m bronze medallist Mark English, who is racing in Birmingham tomorrow to get the 1:48.50 qualifying standard for the Europeans, will fly home afterwards to race in Sunday's final. Sligo sprinter Zac Irwin (18) set a new Irish junior 60m record of 6.83 midweek so he's another worth watching. The national meeting will feature on RTE2 television on Sunday between 6.30 and 7.30pm.